On the face of it, TV had a pretty Q4. Though live viewing fell, DVR usage picked up some of the slack. Dig a little deeper, however, and the shift away from traditional to online viewing continues unabated. According to Nielsen’s Q4 2015 Total Viewing Report live linear TV viewing continued to decline. It fell 2.4% over Q4 2014, to 28 hours a week or 4 hours a day. Over the same period, DVR viewing increased 2.5% to 3 hours and 24 minutes a week. Since time watching linear TV fell 38 minutes a week and DVR viewing grew 5 minutes, the two aren’t anywhere near enough to offset each other. However, in the previous quarter both linear and time shifted viewing declined, so it is an improvement. 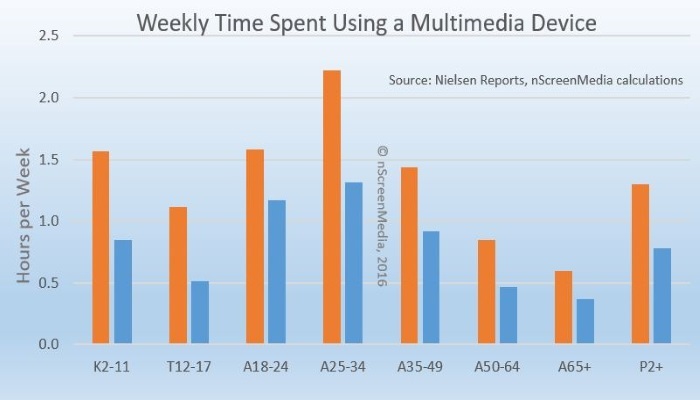 Analyzing Nielsen’s data a little more closely shows all the gains in live and timeshifted viewing are confined to older Americans. 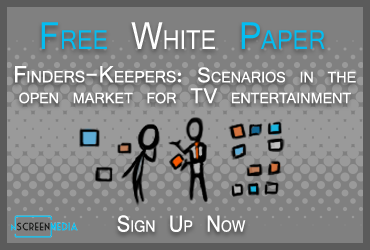 The only group to show an increase in linear TV viewing in the fourth quarter were those over 50. The 50-64 year olds increased viewing 0.6% and over 65s increased 0.7%. The 12-17 year olds watched 15% less linear TV and the 19-24 year olds 10% less. In the last quarter we have seen reports from multiple sources that the use of connected television increased strongly. Nielsen confirms the trend. 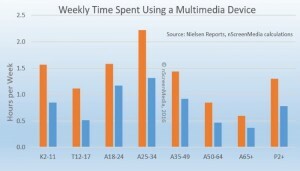 The company says multimedia device (what Nielsen calls connected TV devices) usage increased an impressive 66% year-over-year in Q4 2015, to 1 hour and 27 minutes a week. It will come as no surprise to learn that the biggest increase was in the 11-17 year olds. Their usage more than doubled, from 30 minutes in Q4 2014 to over an hour a week in Q4 2015. There were similarly impressive gains in all age groups. One TV connected device that did not fare quite so well is the game console. Under 17 year olds used the device 5% less in Q4. People aged between 18 and 49 years used it considerably more. There is one TV connected device that everybody used less in Q4: the DVD or Blu-Ray disk player. Usage was down 15% overall, with 15-20% declines in every age group under 35 years. Average usage now stands at under an hour a week. Nielsen’s data marries with DEG data chronicling the decline in disk sales and rentals. Between Q4 2014 and Q4 2015, disk sales fell 12% and rentals (from stores, kiosks, and subscriptions) down 8%. Finally, video viewing on smartphones continues to grow strongly. Overall, time viewing video on the devices grew 54% year-over-year, to an average of 17 minutes a week. Not surprisingly, 18-34 year-olds watch the most, consuming 38 minutes week. The 40-64 year-olds watch the least, at just 11 minutes a week. The young continue to move away from traditional television, both live linear and DVR viewing. Connected TV usage, which has been reported as growing strongly by other sources, shows similarly strong gains in Nielsen data. Mobile video usage also grew strongly, but still represents a small amount of total viewing. DVD and Blu-Ray player usage is falling faster than disk sales and rentals.